Anyone who knows me even a little bit soon realizes I know zilch about houseplants. I don’t grow any. I tried, decades ago, when I realized I was becoming a gardener, and gardeners of course grow houseplants. My cats at the time had other plans, based around the concept of destruction, so I soon gave up. That and the fact that after a long spring, summer and fall of gardening, I’m just not in the mood to spend an additional four months cooped up and responsible for the life of some plant. So I’m the worst houseplant person you’ll meet, but I do know two things related to the topic: 1) You don’t fertilize houseplants in winter. 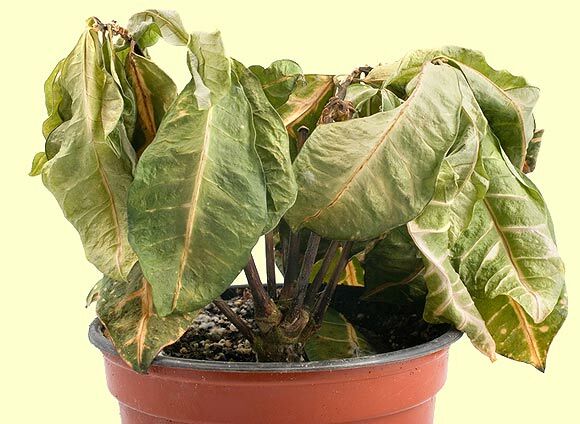 2) A fairly high number of people who grow houseplants don’t know that you don’t fertilize houseplants in winter. You don’t fertilize because plants need time off. Even in very warm climates, there is “winter,” a period of time when plants go into dormancy, hunker down, and don’t grow. You never fertilize any plant that is dormant. The roots don’t want it, aren’t prepared for it, they burn, the plant gets sick, and it dies.